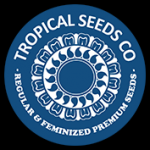 Tropical Seeds - Durbakistan Feminised Seeds. Free US delivery. Durbakistan is the product of a joint effort together with Cannabiogen. The parent strains are Durban Poison and Pakistan Chitral Kush. Durbakistan Feminised is a highly-vigorous, tall sativa-structured plant with long, thin leaves/petioles and a medium inter-nodal distance. As befits a sativa-like strain the colas are very big although somewhat airy and far less dense than those with more of an indica structure. Its effect has characteristics of both parents with sweet, strawberry scents along with earthy/carrot, floral and hashy notes. The flowering period of this strain is between 75 - 80 days. Very good yields can be expected both indoors and outdoors as long as the weather conditions remain mild in the latter stages of flowering. The sativa-like effect is fast and uplifting at first with some energy but this settles down to become calmer as the high evolves. A good strain to get up and do something active.